Welcome back to the eighth installment of DVD Savant’s ten best, or ten favorite discs of the year. Last year I mentioned an impending “leveling off” of the DVD market. In 2008 the Disc business not only plateau-ed, it backed off somewhat. Savant’s interest is purely from the disc collector’s point of view. From where I stand the studio commitment to releasing ‘deep library’ titles has cooled considerably. Even Warners tempered its output after three solid years of WB, MGM and RKO greats. 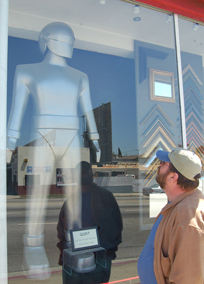 Wayne Schmidt regards a familiar robotic friend in a local store window, April 17, 2008. Fox has run out of Fox Film Noirs and didn’t even number its last three; the absence of a few conspicuously missing items (notably Robert Siodmak’s Cry of the City) must be due to legal issues. We often hear of desired & vintage Fox titles being released exclusively in Region 2. The studio did manage another extravagant classic-era package this Christmas, a Murnau-Borzage collection far beyond the means of most consumers. MGM released only a handful of desirable older films, pretty much shutting down their Midnite Movies line. 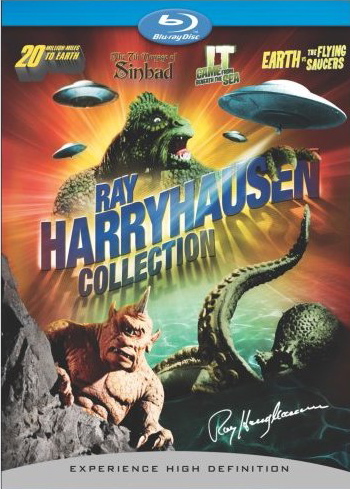 Sony’s library releases have been given a new catch-all branded line called Martini Movies, but they’ve also made an effort to keep the genre fans happy with boxed collections of Horror rarities. The flow of library titles has been lessened by sales results — we’ve heard that Wal-mart no longer wants to stock ordinary library fare — but also by Studio efforts to launch their Blu-ray lines. The Home Video companies haven’t expanded, yet they must develop and market product on a parallel format. In an interesting development, at least a couple of studios are outsourcing lower-tier DVD titles. Warners have entered into “exclusive” contracts with Best Buy, as we’ve seen Universal do in the past. 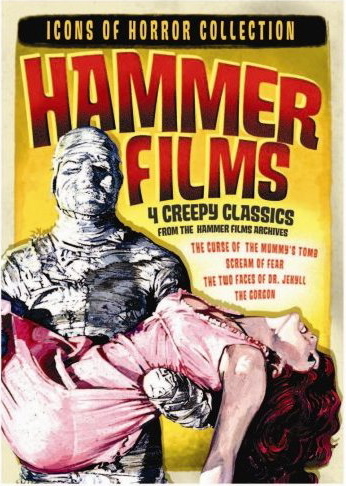 Paramount licensed out a sizeable group of library titles to Legend Films. In both cases the releases have seen little publicity. Because they don’t appear in online resources like Amazon.com, one must frequent web pages like DVD Savant to even learn that they’re available. 2007 is the year that Blu-ray won the HD format war, but not until late summer were desktop players available that could play some of the newer, heavily-encoded discs. This is when we uninformed owners of earlier players discovered that the machines were more like home computers needing potential updates to stay current. Only now at Christmastime has a flow of truly desirable product opened up — the summer’s blockbusters, James Bond movies, etc.. Savant began reviewing Blu-rays in April and has found that they jump the home theater experience to an entire new level of clarity — provided one is equipped with display capabilities larger than 40 or 50 inches. Even when projected ten feet across, they still look fantastic. Warners, Fox, Sony and Paramount have committed solidly to the format, although they continue to reissue special editions in Standard-Def (SD). Warners’ much anticipated Blu-rays of Gigi, An American in Paris and Quo Vadis will follow a few months down the line. Fox has released quite a few Blu-ray Discs (BDs) and has just announced that South Pacific will be out in the first quarter of next year. 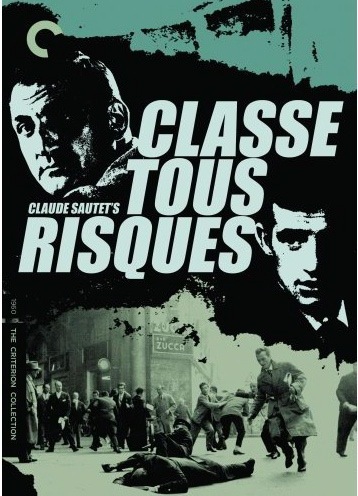 Sony has been more selective; we’re waiting for their bigger David Lean pictures, etc. Paramount has released two or three BDs every month, but so far no older titles — Sunset Boulevard and Sabrina were just reissued in fairly redundant SD special editions. MGM has canceled several titles and some of their encodings haven’t included the extras from previous special editions. They may be redoubling their efforts, as I’ve heard descriptions of upcoming product loaded with features. A welcome late bloomer to the Blu-ray fold is Criterion, which is beginning to offer its quality goods in the superior format, at the same price point as its standard discs. 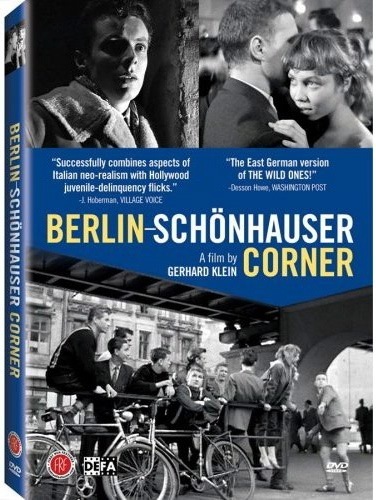 Their first four BD discs are terrific; and I’m sure that they’ll be a hit with Criterion’s high-end clientele. 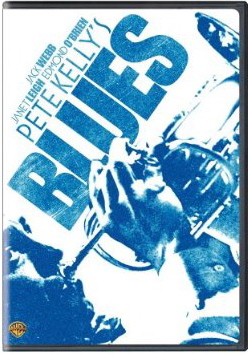 I believe Blu-ray will hang in there. Those that predict that home video watching will eventually be done with web downloads don’t take into account that 80% of consumers know just enough about video to connect a wire or two and push a button. As collectors, we also want something permanent and collectable to hold in our greedy little hands. The quality of Blu-ray is so fantastic that I feel sure it will become much bigger than Laserdisc ever was. The extra technology touted for Blu-ray is so far little more than a bother. A friend just told me that he linked up the BD-Live feature for Mama Mia!, going through a lengthy online registration process only to find a few promos plus a card saying “BD-Live features not yet available”! I resist linking a player to the Internet, as there are already enough databases examining my purchases, habits, whereabouts. I’m not a privacy freak until it comes to electronic intruders seeking my cooperation to be exploited, which is how I view most marketing efforts. Angry consumers defeated DIVX ten years ago and don’t want home video to become the corporate dream of a subscription-based “service”. The powers that be would want us to buy fancy decoder boxes and pricey discs, and still ask permission and/or pay up to view video content. Nope, don’t wanna go there. Of course, the question all of America is asking itself is, how does Savant sort out a list of ‘Most Impressive’ DVDs? It’s a totally subjective luxury. My favorites are not necessarily the most prestigious or academically worthy titles, but indicate what I really enjoyed and what comes to mind when I’d like to reach out and see something again. If a suggestion here prompts a post- Christmas rental or purchase by an adventurous reader or two — then maybe I’ll have done a good job. 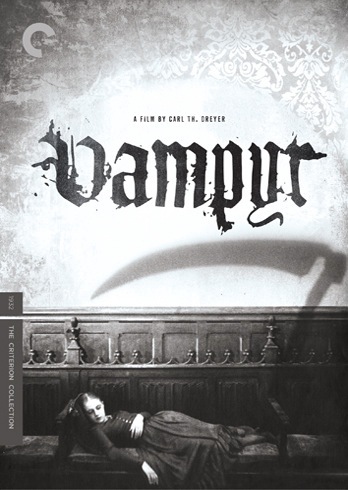 Taking the top slot this year is Criterion’s Vampyr. I must have watched this picture six times trying to connect the incomplete and difficult-to-see versions that were available with the boundless praise in my college textbooks. This very good transfer and its clear soundtrack show Carl Th. Dreyer to be a cinema artist of the first rank, creating unique moods from strange materials — eerie sourceless shadows, strange facial expressions (Sybille Schmitz! ), and an encroaching whiteness that represents death. 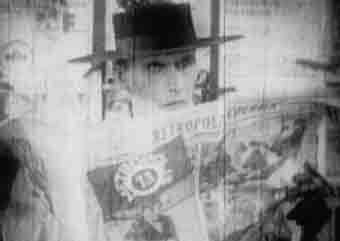 Finally uncut and intact Vampyr also functions as a straight narrative and not merely a collection of dream-states. By making available this superior Cineteca de Bologna restoration, Criterion has essentially “found” a lost film. Universal’s 50th Anniversary Edition Touch of Evil assembles three separate versions of one of Orson Welles’ best. 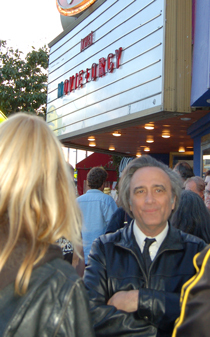 The original Theatrical Release, a longer Preview version and the 1998 Revision are all here. I was initially hostile to the 1998 re-cut, thinking that the Preview version was the way to go. Except for a split judgment on the opening sequence (titles or no titles? Mancini score or source audio track?) the revision now seems superior. Universal’s extras include a fistful of interesting commentaries and some good featurettes. We’ve waited for MGM’s Man of the West for a long time. Today’s fans might not understand why Anthony Mann’s bitter tale of outlawry is considered one of the top westerns of all time. 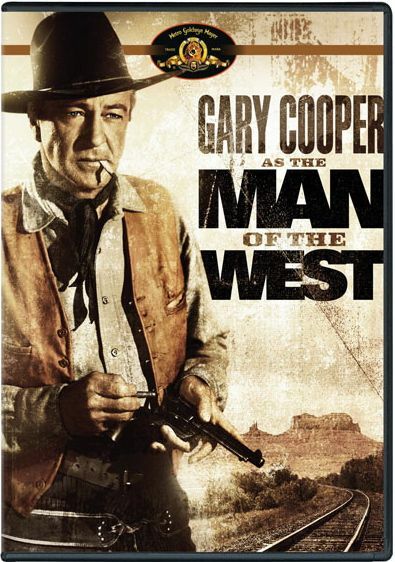 Gary Cooper works against his image as an ex-outlaw struggling to suppress his murderous background. Man of the West is a good example of a movie that transcends its genre despite its flaws — in 1958 it was a complete reversal of the usual sagebrush formula, as it presented one disturbing scene after another. 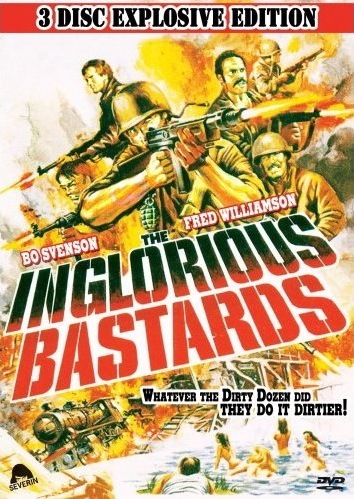 A huge influence on the films of Sam Peckinpah, I have to say. I wasn’t aware of it before, but Westerns dominate this year’s top ten. Sony thrilled the genre faithful with its release (finally) of a boxed set of Randolph Scott / Budd Boetticher pictures, a tight group of modest action features also associated with writer Burt Kennedy. 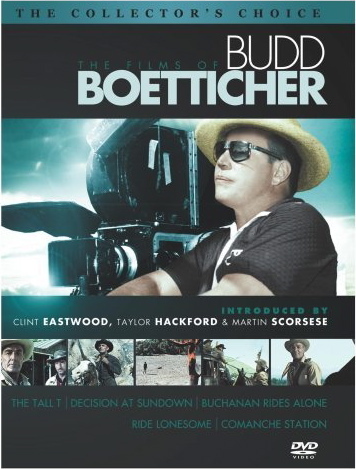 The Films of Budd Boetticher rolls out the great titles, several of which haven’t been easy to see: The Tall T, Decision at Sundown, Buchanan Rides Alone, Ride Lonesome and Comanche Station. Randolph Scott may be searching for a lost woman or simply trying to survive in a tense situation, but he carries a nobility all his own; one can imagine him standing eye to eye with most any western icon, and maintaining a moral advantage. 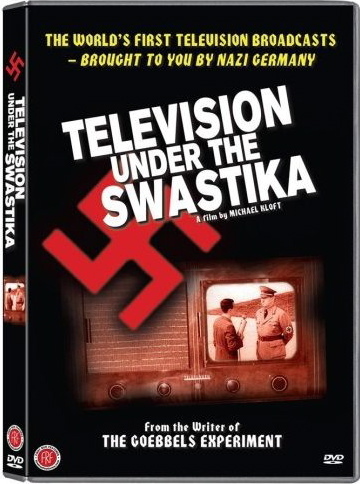 With some good commentaries and an illuminating docu. 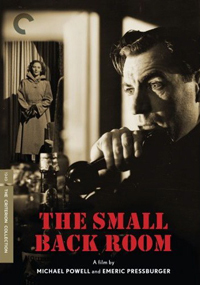 Criterion’s The Small Back Room shows the magical team of Michael Powell and Emeric Pressburger opting for a claustrophobic personal drama, in B&W. David Farrar is an unhappy, nearly alcoholic “boffin”, a research engineer caving in under the pressure of a wartime bureaucracy that wastes effort in unnecessary turf wars between departments and ministries. He’s supported by a faithful girlfriend (the amazing Kathleen Byron) and drawn toward duty suited only for an engineering daredevil — the dismantling of booby-trapped unexploded Nazi bombs. A very rewarding sleeper, for people who like pictures like Savant’s favorite The Purple Plain from a few years back. All this cinema art calls for a classic monster break, provided by Classic Media’s Rodan. It and a lesser Toho effort called War of the Gargantuas, are offered in original Japanese versions and English-dubbed American recuts. 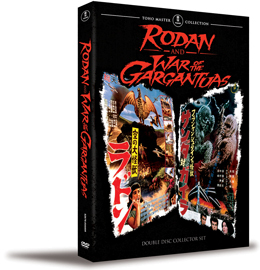 Rodan hails from early in Toho’s series of giant monster fantasies, and its appeal goes far beyond its rubber suits and amazingly detailed miniatures. The story may already have been old-fashioned but the combination of music, color and exotic visuals is more potent than many of today’s CGI wonders. 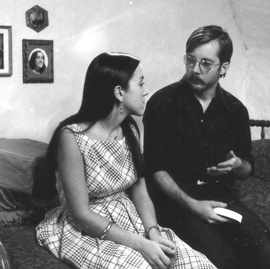 The American version doesn’t look nearly as good, but it’s an excellent cut-down with a narration script that adds to the feeling of modern myths in the making — the two flying monsters finish Romeo and Juliet– style, in a ritual conflagration. The package includes a great docu on Toho’s miniature makers and special effects experts. 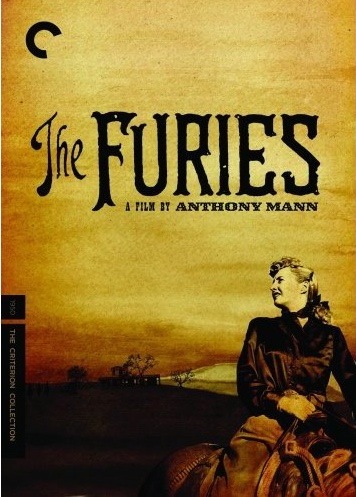 Criterion strikes again with The Furies, another terrific Anthony Mann western. Structured as an odd mix between Shakespeare and Mann’s later big-screen spectacles, The Furies brings high drama to the “big ranch” subgenre. Barbara Stanwyck’s daughter competes with Walter Huston’s monstrous father for the right to carry on his name. A largely unsung masterpiece. 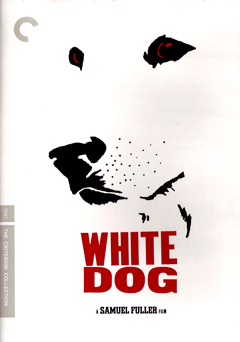 Criterion’s extras include rare interviews with the director. Yet another western! This sprawling epic is included for its creative (and expensive) commitment to a difficult presentation problem — how to replicate the “feel” of Cinerama on a home video screen. 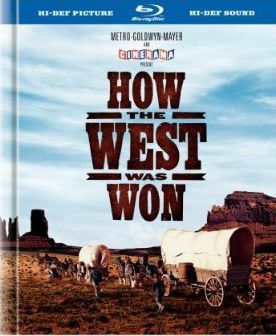 Warners’ How the West Was Won directs the extra resolution of Blu-ray at the extra-wide 3-panel Cinerama format with excellent results. 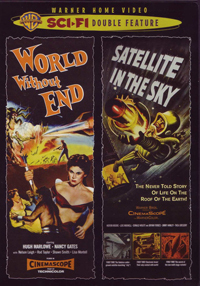 The Blu-ray version contains a normal flat transfer plus a Smilebox version that distorts the screen shape to better convey Cinerama’s original wrap-around look. A great deal of ingenuity went into making the show play smoothly, and the effort pays off on a large screen. The disc set includes a fascinating feature-length docu on Cinerama history. 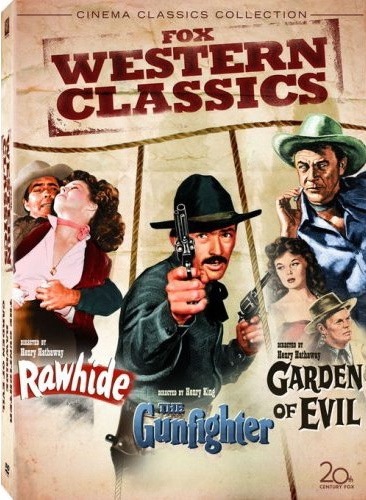 Fox’s Western Classics are a trio of superior westerns that show the genre adapting to new tastes and a new screen shape in the 1950s. Henry King’s The Gunfighter is an out-and-out classic with Gregory Peck as a gunman unable to outride his reputation, or restart a normal life. Henry Hathaway’s Rawhide is a tense suspense tale of a stage stop held up by outlaws, starring Susan Hayward, Tyrone Power and Hugh Marlowe. Hathaway’s early CinemaScope spectacle Garden of Evil matches Hayward with Gary Cooper and Richard Widmark. It can’t match the first two for dramatic values, but its hypnotic combination of Bernard Herrmann music and strange landscape effects turns a western setting into something sinister and foreboding. It’s the Savant equivalent of a guilty pleasure, with extenuating circumstances. 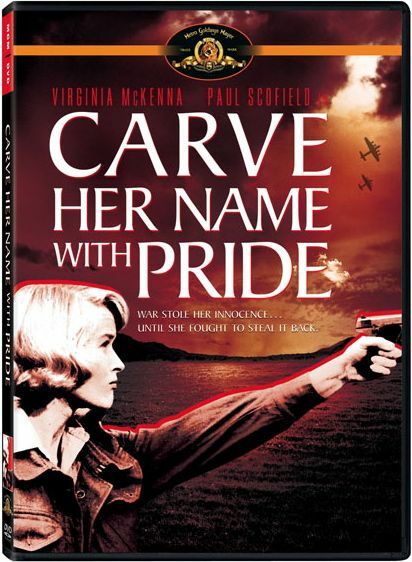 The final winner is MGM’s Carve Her Name With Pride, a haunting tale of espionage and patriotism. Virginia McKenna found her defining role as Violette Szabo, the Franco-British spy sent to occupied France to work with the underground resistance. Why Violette goes, and how she fights when cornered, is a terrific true story; it’s also a legend based on an unforgettably poignant poem used as a code. Perhaps obscure, but highly recommended; MGM’s disc is frustratingly not 16:9 enhanced, but the show’s merit overcomes that drawback. In January I’ll have completed ten years as an online reviewer of DVDs. I’ve had a great time discovering old movies but I have to say that the greatest reward has been the ability to meet so many new friends. I hope I’ve answered my mail as best I could and continue to invite questions and opinion emails,. The feedback is a big help. The responses to my review of Oliver Stone’s JFK were so educational, I reprinted another critic’s review to rebut my own! The henchman “Slim” tracks his foe in a recovered scene from Metropolis, which we’ll hopefully see next year!